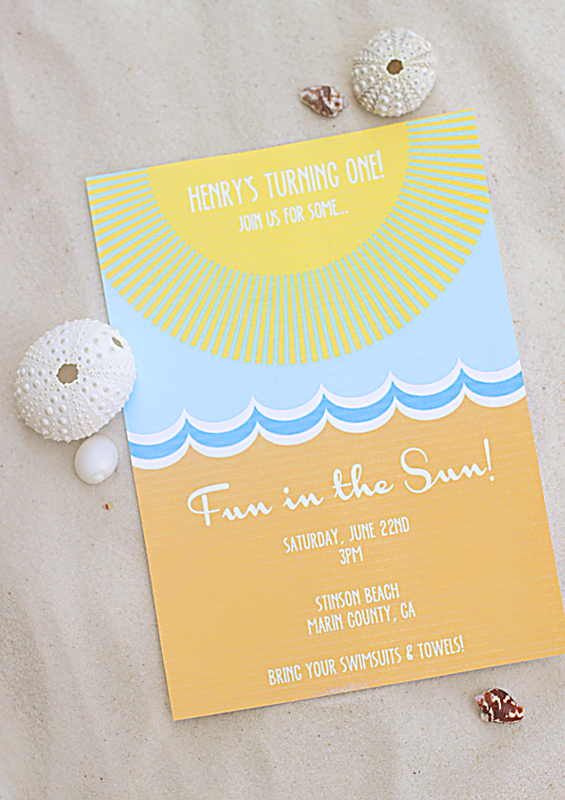 All printable party supplies for this post were provided by the good people of Minted. Thank you for supporting all of our loveable sponsors. The breakfast menu was delicious, though perhaps not quite nutritious. We started with mini veggie quiches and greek yogurt with honey + fresh strawberries. Michele of Cakewalk Baking brought over a yummy lemon cake and muffins with lemon curd + cream cheese frosting. 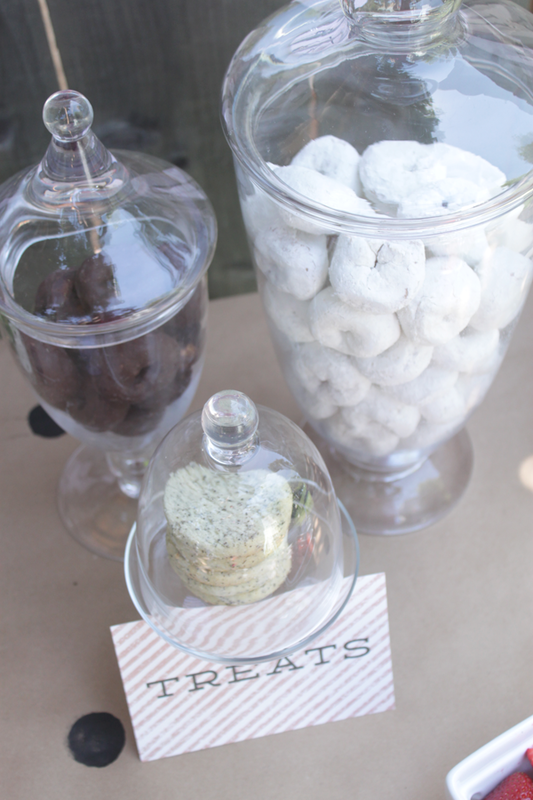 And then we had a few apothecary jars full of mini donuts... because obviously we didn't have enough sweets already. To drink (in addition to coffee), I offered grapefruit or apple juice to mix with Prosecco for a unique twist on mimosas. 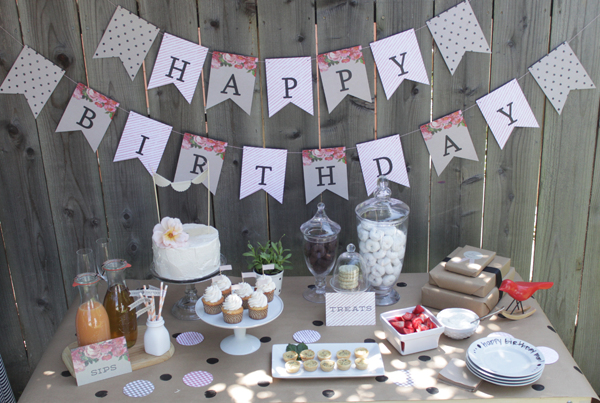 I topped the cake with a few scalloped stickers and strung them along a length of twine, then grabbed a big rose from our garden to coordinate with the happy birthday banner. 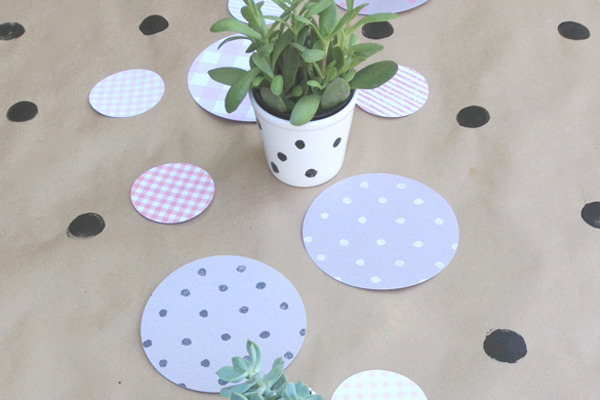 The table runner was easily made by stamping black circles on kraft wrapping paper using a round sponge brush. Notice how it again ties back to the banner as well as some of the oversized table confetti? 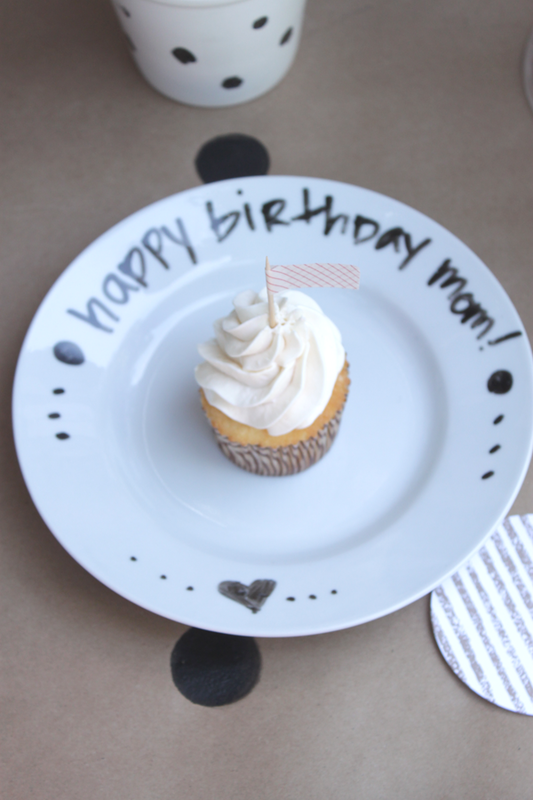 In my favorite project of the day... the hand drawn dotted planter and dessert plate were made with dry erase marker. Obviously you don't want it to touch your food, but it's such a fun way to add a finishing touch that won't ruin your ceramic dishes. After the party it just wipes away! 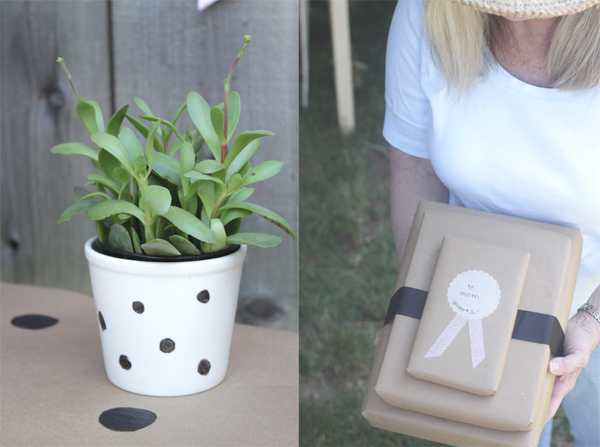 It was so cute to see my mom wowed by the details that were just for her. 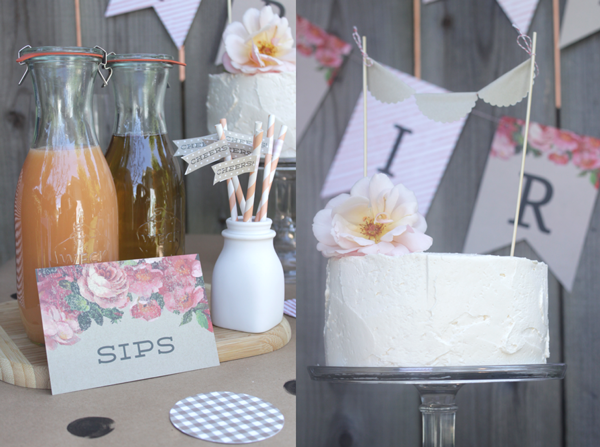 And this one was easy to put together on a tight schedule... aren't breakfast parties the best? 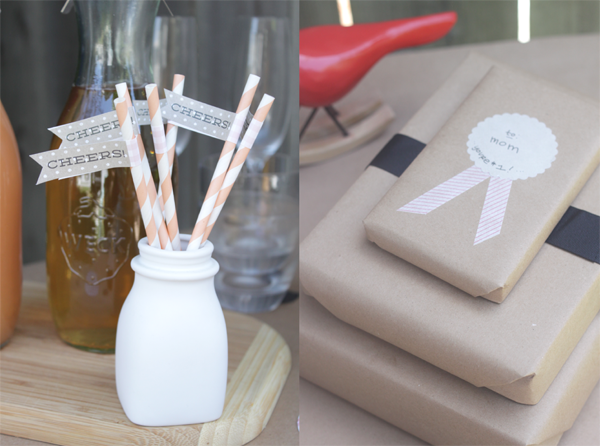 Special thanks to Minted + Cakewalk Baking for helping bring this celebration to life. 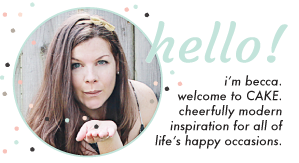 These images are for personal use only. 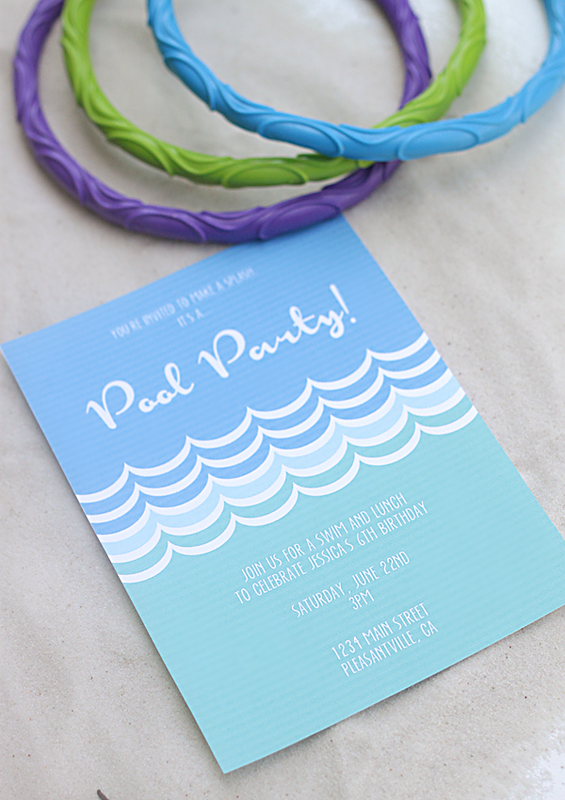 If sharing them on your site, please credit CAKE. events blog and link directly to this post. Sometimes living in Northern California it's hard to tell where spring ends and summer begins. 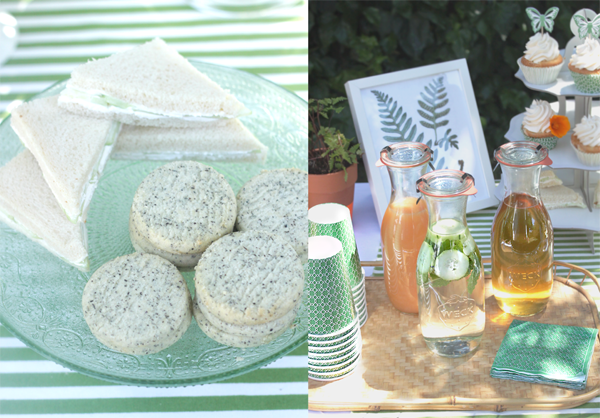 We're blessed with mild weather throughout much of the year, which makes outdoor entertaining a joy. June is my favorite month of all... the flowers are in full bloom and everything still looks so lush and green. 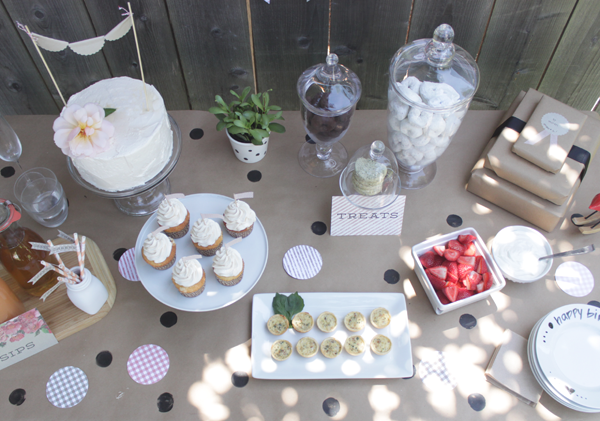 Last weekend I took advantage of the season and hosted a small party for a friend's birthday in our backyard. 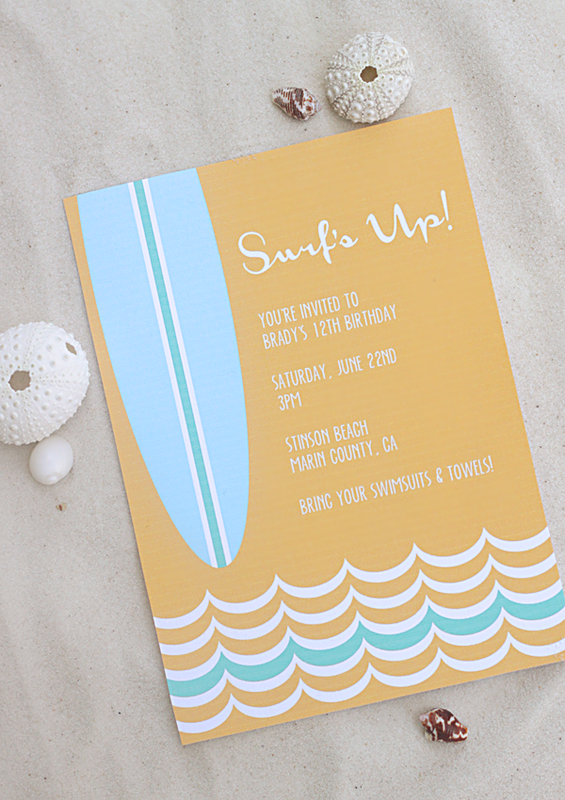 I knew I wanted it to have a botanical feel after I saw the new Sweetgrass collection from Martha Celebrations, and I decided to mix it up with some bright bursts of California Poppy orange. 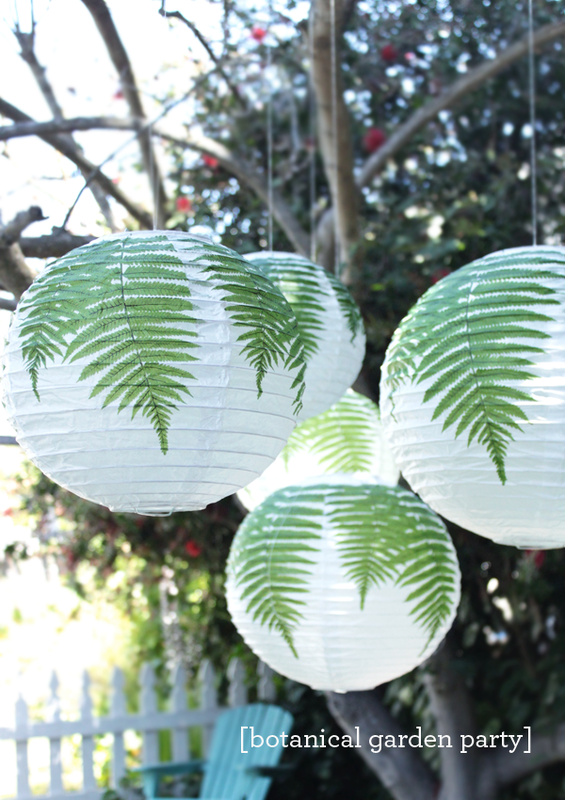 This was an informal gathering so I set our picnic table up as a buffet with a green + white striped fabric that I often use as a tablecloth, and hung the lovely fern paper lanterns from the trees above. 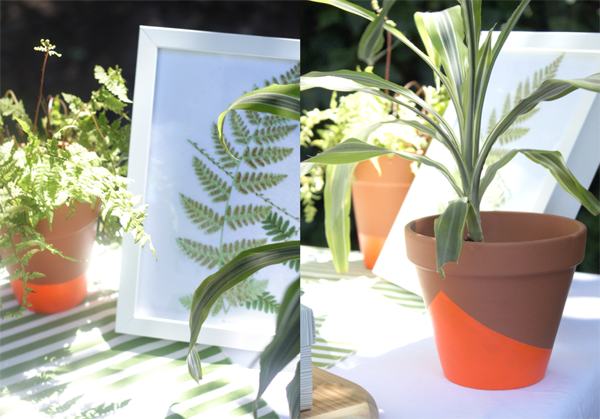 To add a little extra orange color, I was inspired by this post to make some hand painted terra cotta pots. I used washi tape to mask off varied heights and, after realizing the orange craft paint was going to get totally soaked up by the terra cotta, I remembered that I was supposed to put down a layer of white paint first. As you can see it really helped the color pop. I also framed a few botanical prints that I found here and spruced up in photoshop. Fun, right? 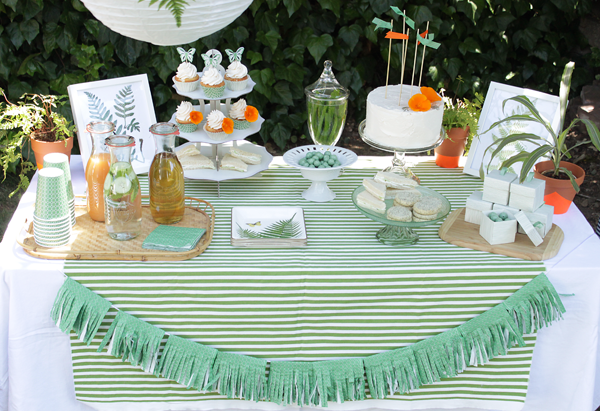 I adorned the table with a garland of... handmade fringe napkins actually. 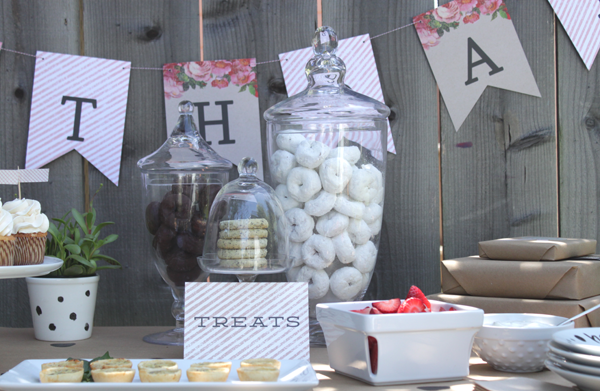 Pretty sure this was the most fun and easy craft project I've done in a while... and it's a great way to make your party supplies do double duty! 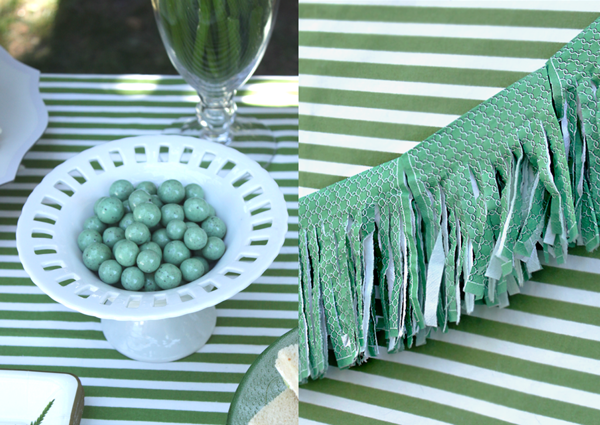 How to Make a Fringe Napkin Garland: Hold your napkin so the fold is facing up & away from you. Take your scissors and cut up about 3/4 of the napkin height, leaving at least a 1/2" space at the top. 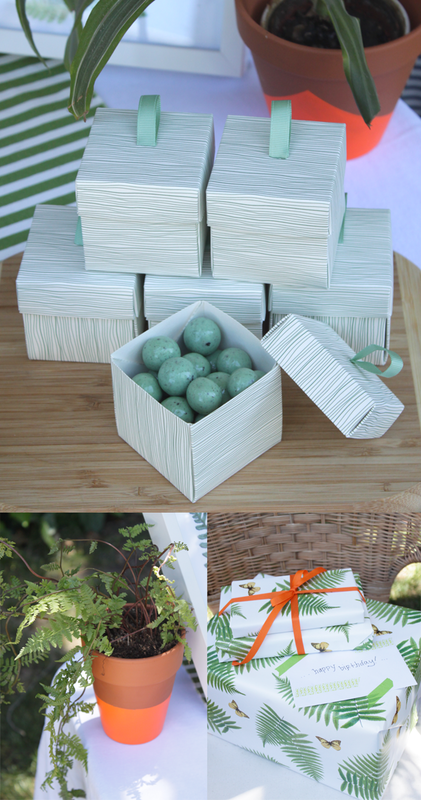 String through your ribbon and secure the center of each napkin with a glue dot or double stick tape. Done and done. As is always the case when I'm in need of a cake, I reached out to my friend Michele of Cakewalk Baking. She created a delicious white birthday cake with buttercream frosting, along with her classic vanilla cupcakes (and even stayed to help me put everything together because she's just that awesome). 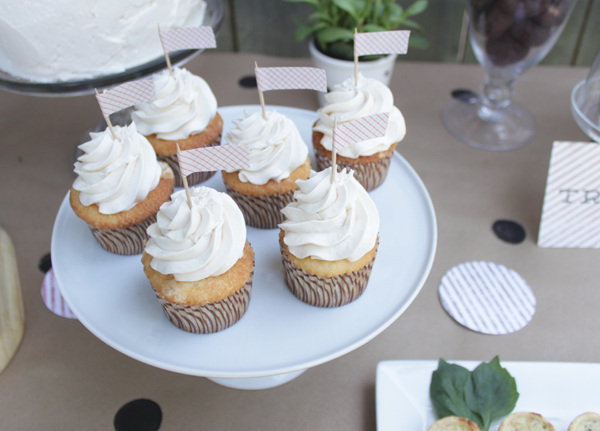 I topped the cake with a variety of ribbons tied on skewers, fresh California poppies from our yard and added pretty butterfly picks to the cupcakes that coordinated with the wrappers. There was also an assortment of little sandwiches (who doesn't love little sandwiches?) along with tea cookies and some candy treats. The drinks were served out of weck juice jars on this vintage bamboo tea tray that I scored at a thrift shop. We coudn't have asked for a nicer afternoon... sadly the pictures I took don't begin to do it justice. As nice as the weather was, dappled sunlight sure does make for some challenging photography! 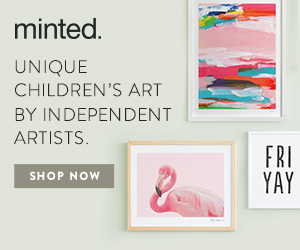 If you enjoyed this party, be sure to check out the #LetsCelebrate pin party and take a peek at what some of my favorite bloggers did with their Martha Stewart Celebrations products. 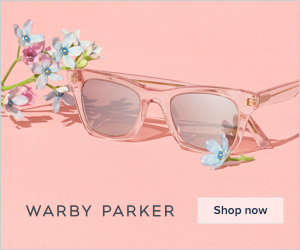 All of the Martha Celebrations at JCP products featured in this post were provided by the Editors at Martha Stewart Living, a team that loves a good party and deeply admires the bloggers who throw them. All opinions featured in this post are my own.